altitude and terrain. Rather than giving up, seatless Cindy pushed even harder. Cult status: People still talk today about Cindy´s seatless victory in the ´87 Sierra 7500. Even without a seat Cindy finished 20 minutes ahead of the pack, which included Jacquie Phelan. Twenty minutes ahead and no seat ? 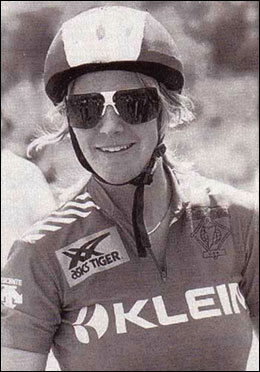 This victory ensured Cindy a place in mountain bike history. Amazing ! Two careers in one: Cindy Whitehead represents the first generation of fat-tire flying females who could bike-handle with the best on the descents and power the uphills mercilessly. 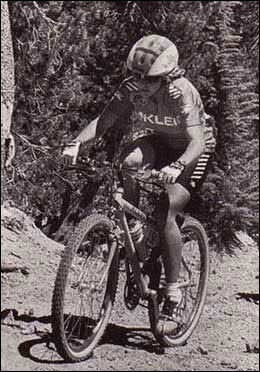 After a stellar cross-country career Cindy switched to full-time downhill and scorches to this day. No one could believe it. Cindy hammered through the White Mountains of Bishop with a bare seatpost sticking up. She couldn´t sit. She couldn´t rest. She couldn´t get the seatpost out. just like in a Hollywood movie, Cindy went on the finish a full 20 minutes ahead of Jacquie. Cindy crossed the finish line with a smile on her face and a place in mountain bike history.